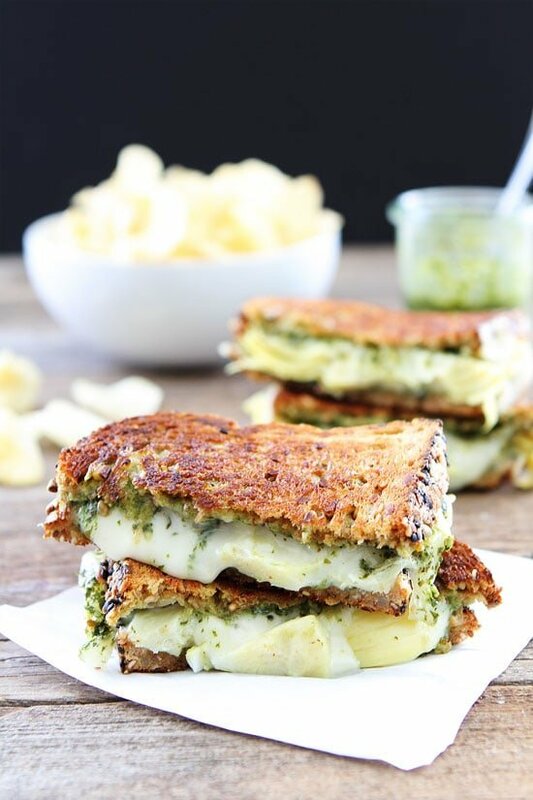 Pesto, Artichoke, and Havarti Grilled Cheese-this simple grilled cheese sandwich is bursting with flavor! 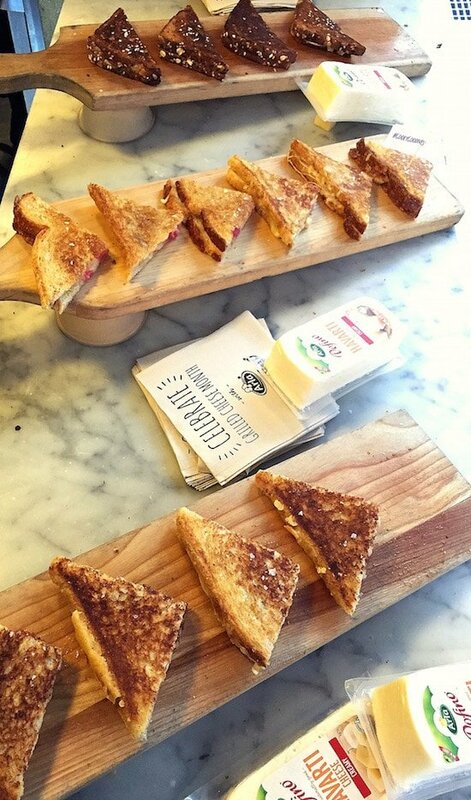 If you follow us on Instagram, you know that we were in New York City earlier this month to celebrate National Grilled Cheese Month with Arla Dofino. I am always up for a trip to the Big Apple, but add in grilled cheese…best trip ever! We had so much fun! 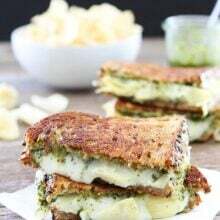 Today, I am sharing a few highlights from our trip, which includes a recipe for a Pesto, Artichoke, and Havarti Grilled Cheese. 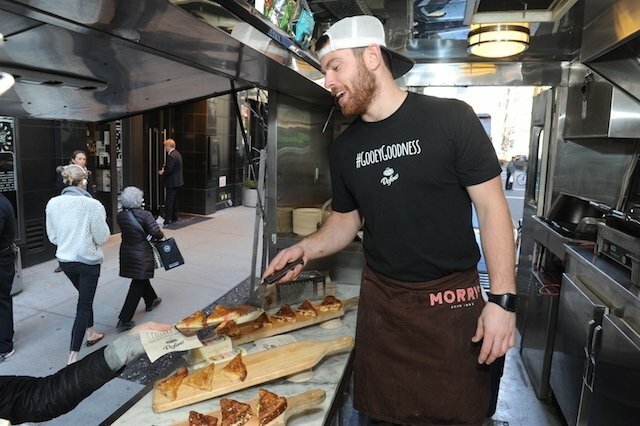 I created this grilled cheese for the NYC event and it was a huge hit so I want to share it with all of you too! The only bummer is that I can’t give you samples like we did in NYC. Sorry! 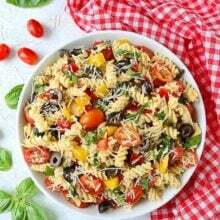 You will have to make it at home, but it is super easy and SUPER delicious! So back to the event, we were in NYC to kick off National Grilled Cheese Month. 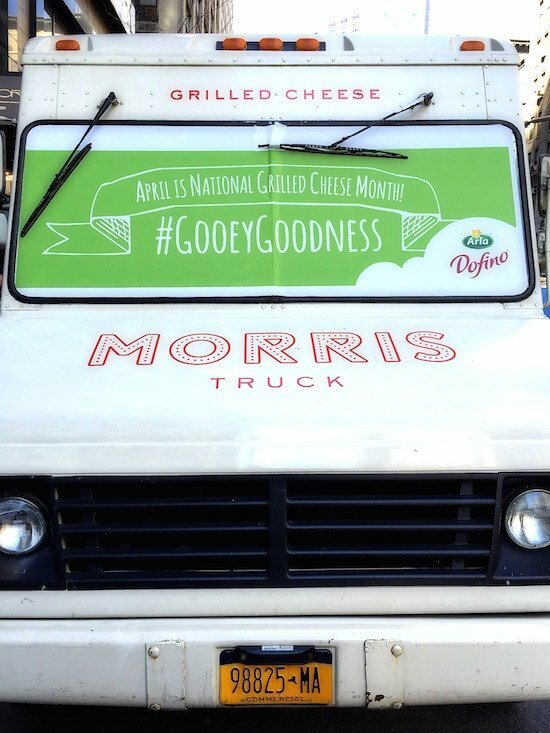 We teamed up with Arla Dofino and Morris to bring #GooeyGoodness to New Yorkers! We visited Refinery 29, The Kitchn, BuzzFeed, The Huffington Post, and even had a fun sampling open to the public. We served up three grilled cheese sandwiches. I created the Pesto, Artichoke, and Havarti Grilled Cheese that was served on Eureka’s Saaa-Wheat Organic bread. Morris dreamed up a Braised Beet and Balsamic Brown Butter Grilled Cheese with Havarti, Gouda, and a Sherry Maple Vinagrette. My food blogging bud, FoodieCrush, created a Sweet Bacon and Brown Sugar Grilled Cheese with Gouda and Candied Pecans. Yes, there was a lot of Gooey Goodness going on! All of the sandwiches were very different, but all SO good. Arla Dofino Havarti and Gouda cheeses Havarti and Gouda cheeses are naturally good, crafted with quality ingredients, and free of added hormones, colors and preservatives. They are the perfect cheeses for grilled cheese sandwiches because they are super melty and have a mild, buttery flavor. You can pair them with anything and everything…and they will give you LOTS of Gooey Goodness! When we showed up at the locations and told people we were serving grilled cheese sandwiches to celebrate National Grilled Cheese Month, they thought we were joking. It was April Fool’s Day on the first day, so they really did think it was a big joke, but we don’t joke about grilled cheese. We were ready to serve grilled cheese to the masses. Everyone was thrilled! I think I even saw a few tears of joy:) Grilled cheese for everyone! Yay! I love that everyone was sharing the #GooeyGoodness on social media! I got the chance to work in the Morris Truck. It was so fun! I loved handing out grilled cheese and watching people’s reaction as the tasted the sandwiches. Smiles all around! Ben, the grilled cheese master, at work! It was a fun and cheesy event! I was sad to leave NYC, but happy to come home to make my Pesto, Artichoke, and Havarti Grilled Cheese. The Gooey Goodness lives on! To make the grilled cheese, I use our favorite Spinach Basil Pesto recipe. It is simple to make and full of flavor. I spread the pesto on Eureka!’s whole grain bread. Next, comes the cheese! I love using Arla Dofino Creamy Havarti slices. So easy and soooooo cheesy! I add artichoke hearts to the mix because I love them and they compliment the pesto perfectly! This is a great spring grilled cheese! Cook until buttery, crusty, and gooey! YUM! 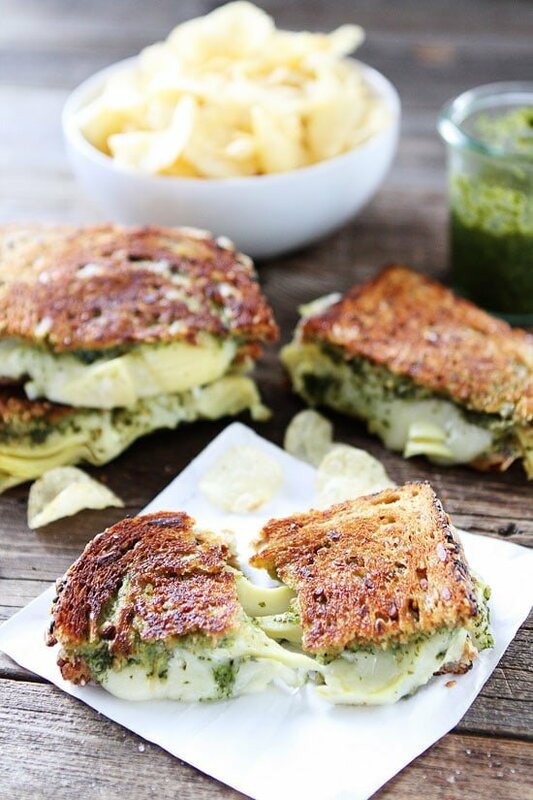 You’ve gotta try this Pesto, Artichoke, and Havarti Grilled Cheese Sandwich. It was a hit in NYC and I guarantee it will be a hit at your house. Enjoy! 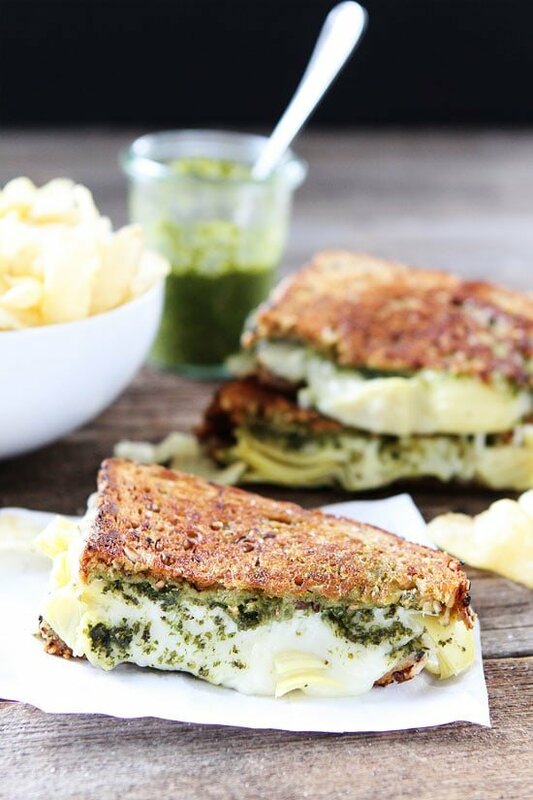 This grilled cheese sandwich is made with spinach basil pesto, artichoke hearts, and creamy Havarti cheese. It is always a hit! Butter the outsides of the bread with butter. Spread the insides of the bread slices evenly with pesto. Put a slice of Havarti on the bottom piece of bread, add artichoke hearts, and top with another slice of Havarti. Place the other piece of bread on top, creating a sandwich. Heat a large skillet or griddle pan over medium-low heat and place the sandwiches butter side down. Cook for 4-5 minutes, or until the cheese starts to melt and the bread is golden brown. Carefully flip the sandwich over and cook for an additional about 3-4 minutes. Remove from heat and sprinkle with sea salt. Cut sandwiches in half and serve immediately. Note-for gluten-free, use gluten-free bread. The amount of cheesy goodness in this post in INSANE! And I am not complaining one bit. I love that you grown-up-i-fied a classic sandwich with that awesome pesto! Pinning! 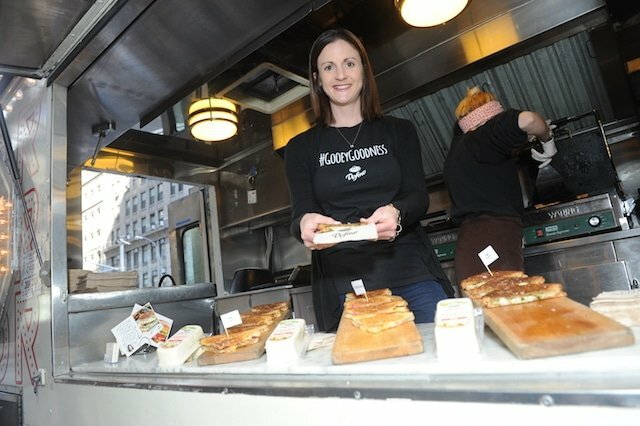 Would have love to have had a sample of your grilled cheese in NYC! My husband always gets samples for the kids at BJ’s and Costo’s and is always crossing his fingers they don’t want them. Really like the pesto and artichoke on there. Scrumptious. Oh man! What a fun event int NYC! I’d be all over that grilled cheese truck 24/7. And your grilled cheese has all of my favorite flavors but man, that cheese is melty perfection. Now that’s a tasty looking grilled cheese! This looks so good!! I LOVE all that ooey gooeyness! Whatever sounds good for breakfast (even leftover pizza) is what I eat for breakfast!! The first thing I do in the feed Rachel the Cat, grab a cup of coffee and read my emails to slide into the day … Well, guess we for breakfast?! 😉 I don’t have Havarti on hand so switched it up with Smoked Gouda!! Yum, yum, yum!! Thanks for the recipe and story about your NY adventure this morning, Maria!! Oh my gosh, SO FUN!! Sounds like the best kind of day — surrounded by carbs and melty cheese 🙂 Your sandwich is absolutely gorgeous!! Looks like such a FUN trip to NYC!! This melty pile of goodness has me drooling all over. 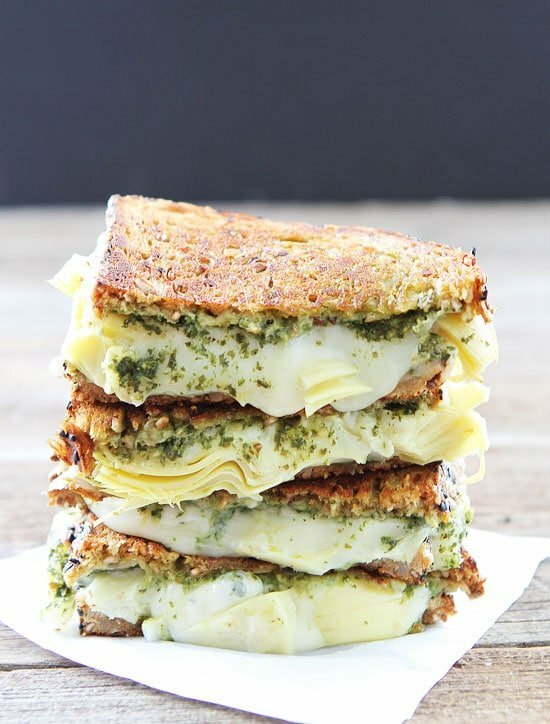 Pesto is one of my favorite things to put in sandwiches, and I’m sure the artichokes brought out the creaminess of the cheese even more! The trip to NYC looks like it was a blast. Jealous of your adventures! 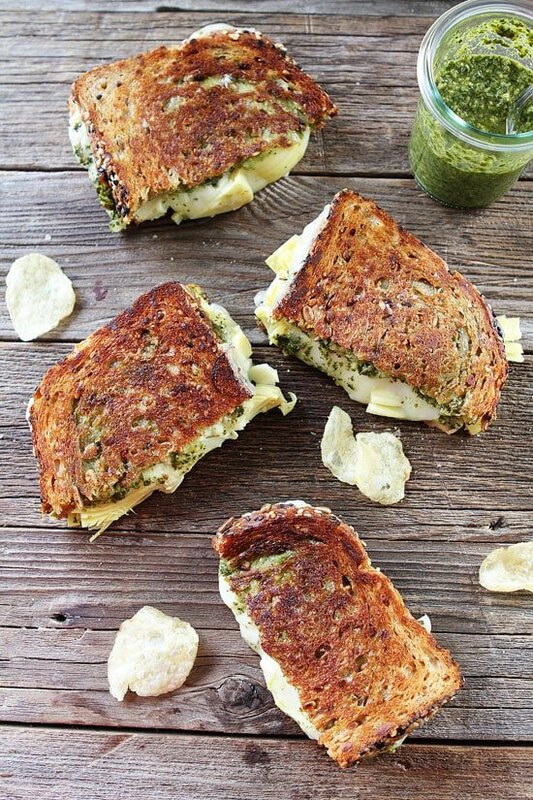 I love pesto on sandwiches too! 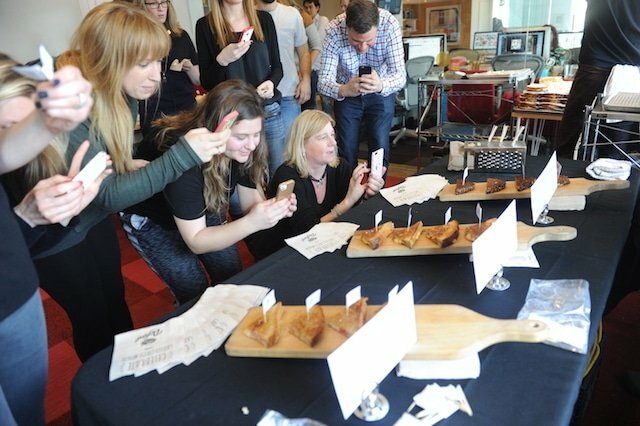 What a fun event and what mouthwatering grilled cheese!! 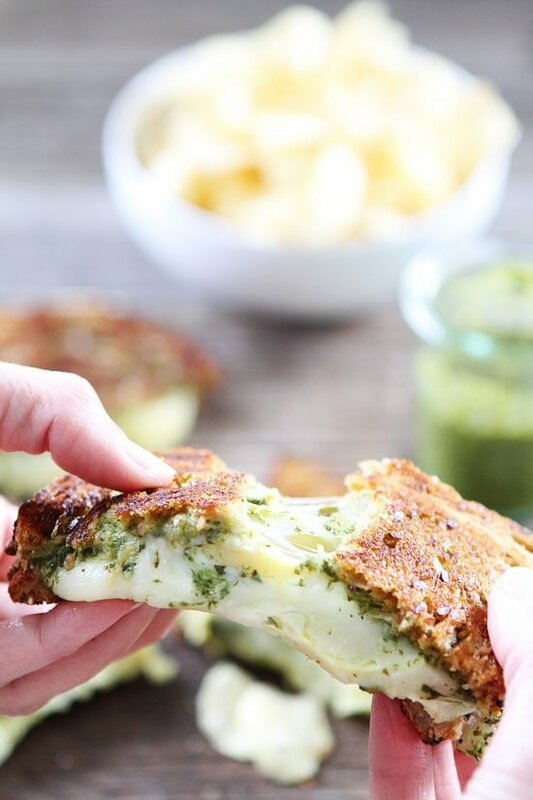 Havarti and pesto sounds like a divine combination. Looks like a fun trip! And that grilled cheese – WOW! It was a fun and cheesy trip! I just made your havarti grilled cheese. Delish!! Will make them for everyone I know. So easy yet so gourmet. What is your favorite place to eat in New York City? I need some suggestions. Thanks! That is a tough question! 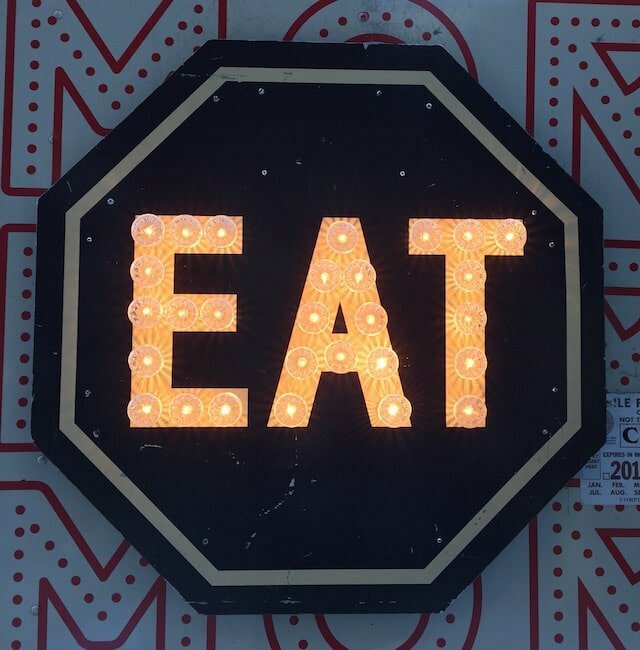 There are SO many great places to eat! You can see some suggestions here: https://www.twopeasandtheirpod.com/new-york-city-part-2/ and here: https://www.twopeasandtheirpod.com/new-york-city-part-3/ Those are mostly sweets:) Eataly is fun! We also liked Ippudo for Ramen. Go to Sarabeth’s for breakfast! Thank you so much for this heavenly combo, it was just ridiculously good! Absolutely perfect as it is but next time I’ll add thinly sliced avocado just because I love avocado and think it will go really nicely vith the other flavours. This was amazing. I did only have havarti slices instead of the shredded but of course it made no difference. It was so nice having something other than the regular american grilled cheese. Glad you liked the sandwich! I can’t believe the outcome of this grilled cheese, it was absolutely to die for! I never thought I’d be so in love with a grilled cheese, I made this last night for the whole family and even the kids liked it! Thanks for sharing!